My husband and I took our 3 boys on a cruise when they were all under eight years old. We have three boys so we catch a lot of stares for that reason, but taking the three of them on a cruise with all under the age of eight brought even more stares. People thought we were crazy to bring three young kids on a cruise, however it was the best vacation we could have hoped for! I was very pleased with our choice to go on the Carnival cruise ship the Fantasy. 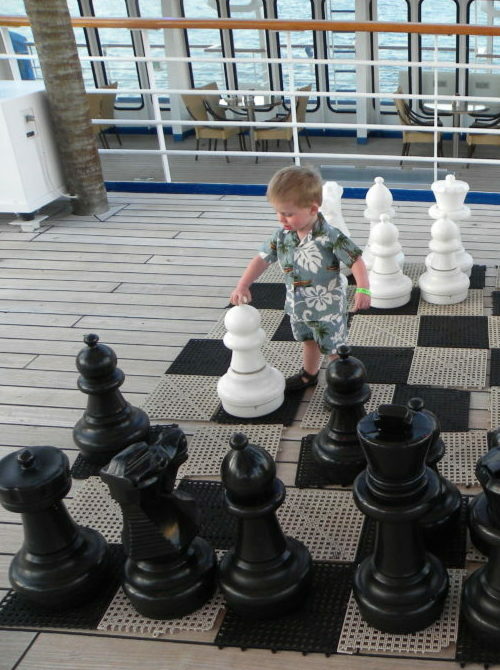 I’m sharing 12 cruise tips for traveling with 3 young kids under age 8. This post contains affiliate links. Please see my disclaimer in the top bar menu for more details. 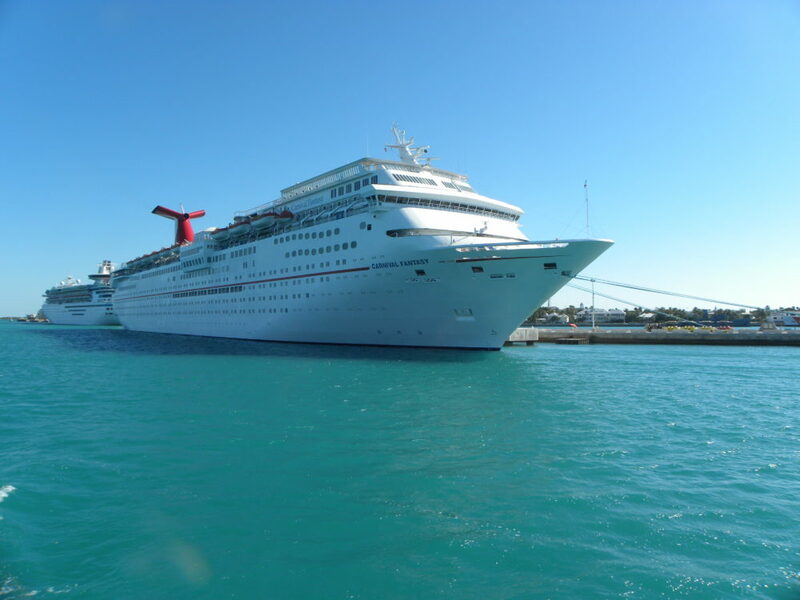 We stopped at three ports on our Carinval cruise with two of them in the Bahamas. 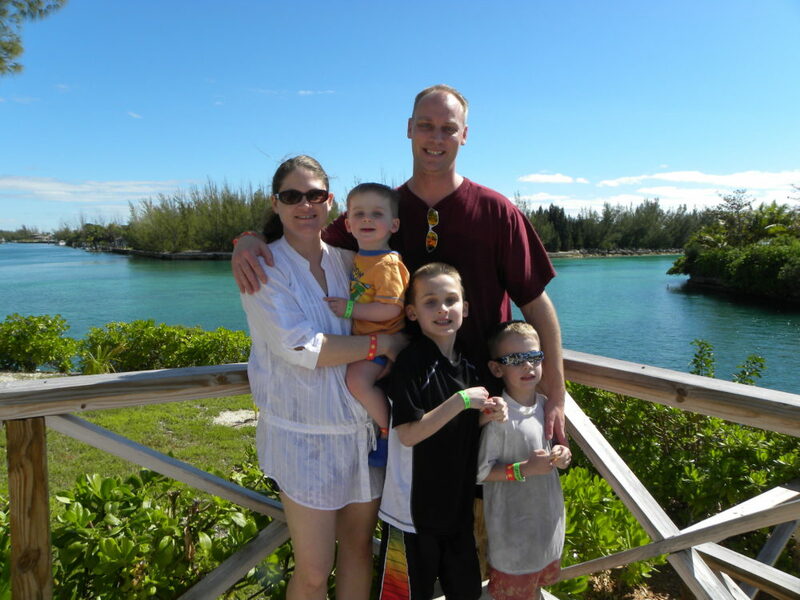 Our family of five trekked off the boat in Freeport, Bahamas, and Nassau, Bahamas. The other port the cruise ship stopped at was in Key West, Florida. We loved all three stops because each stop fun and awesome entertainment to offer. Our boys were the ages of 7, 4, and 19 months at the time of our trip. 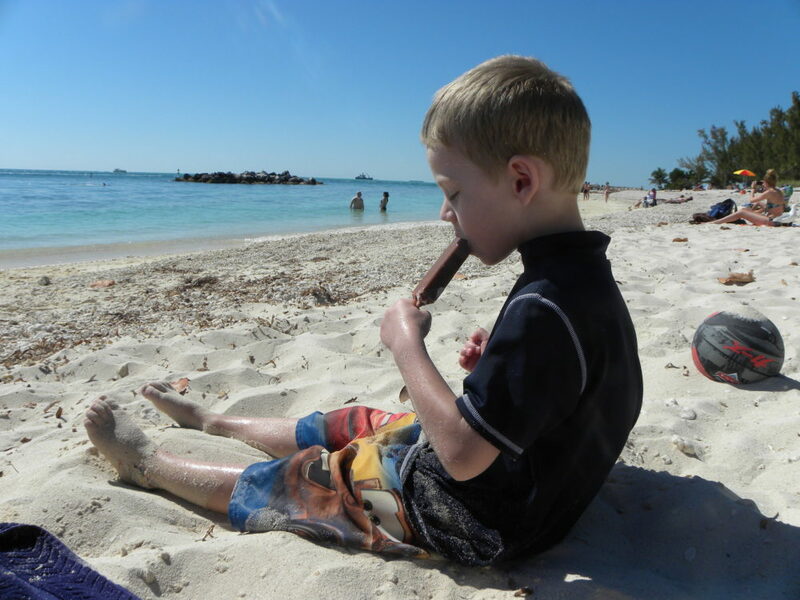 I’m sharing my travel tips I learned while cruising with young kids. I suggest you travel to the port city the day before your cruise takes off if you are coming from out of town. We flew into Charleston, South Carolina, and stayed at the Sheraton Hotel the night before our cruise was scheduled to leave. The fear of the ship leaving without us because of travel delays and traveling with young kids brought us to this decision. If you miss the ship, your whole trip is ruined! It was really quite fun because it gave us an extra night in a hotel to relax. Our family woke up refreshed after a good night of sleep; we felt rested from the flight plus we had plenty of time to get to the ship for boarding. We found this plan really helped to reduce the stress of traveling with young kids. Flying the day before the cruise ship was scheduled to leave reduced the stress of trying to fly and make it to a cruise ship in all one day with young kids. 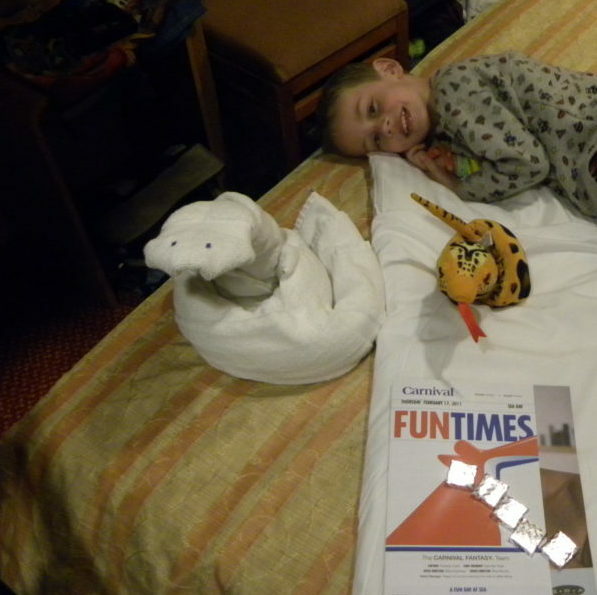 Family fun and memories made wonderful on a Carnival Cruise vacation! My husband researched and found a cruise ship that fit our family’s needs called the Fantasy by Carnival Cruise line. 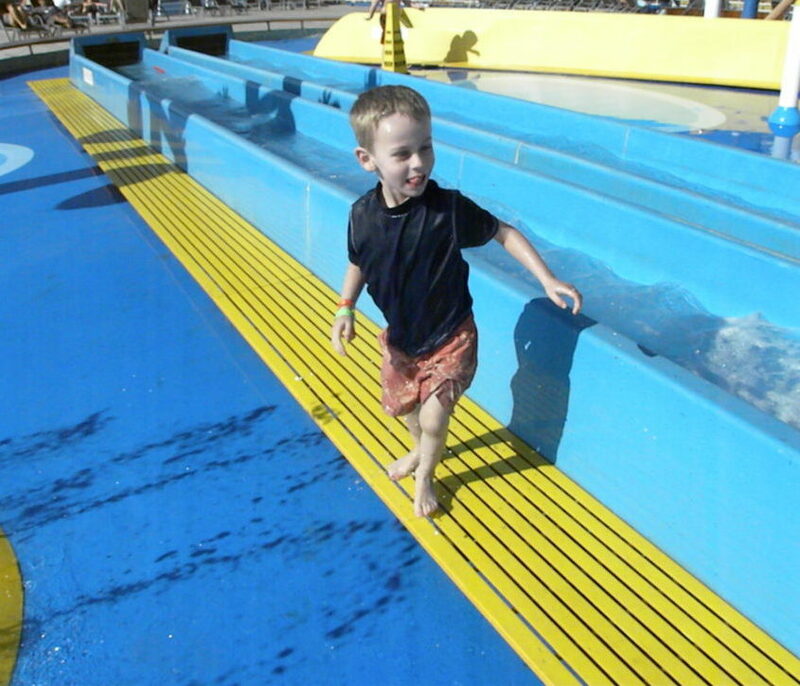 It offered age-appropriate activities and amenities for our three boys under the age of 8. We needed sleeping arrangements for five. We have often found it a challenge to find travel accommodations for a family of five. The only reason a regular room worked for us on the cruise was because our youngest was still sleeping in a crib so the cruise staff simply wheeled one in for him. We also enjoyed several activities onboard that fit the ages and interests of our kids perfectly such as a mini golf course, video games, a water park and pools, an on-stage magic show, and Camp Carnival. The mini golf course was a giant hit with our boys. 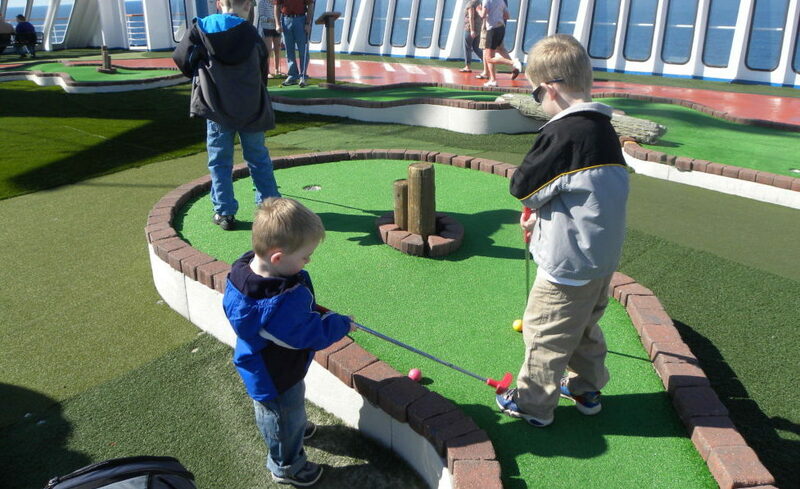 They were thrilled to play a favorite sport on the top of a cruise ship! 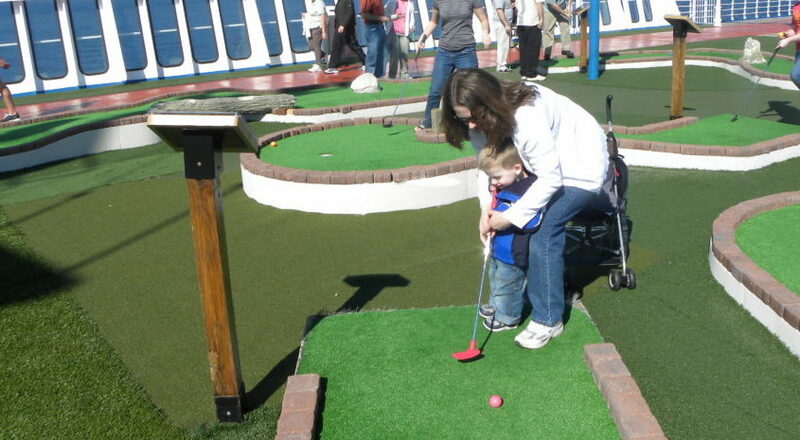 Even our youngest could use the mini golf course as a toddler. The environment was very family friendly on the course which was great because it took us a long time to finish each hole! The cruise ship had a water park with water slides and a water feature. 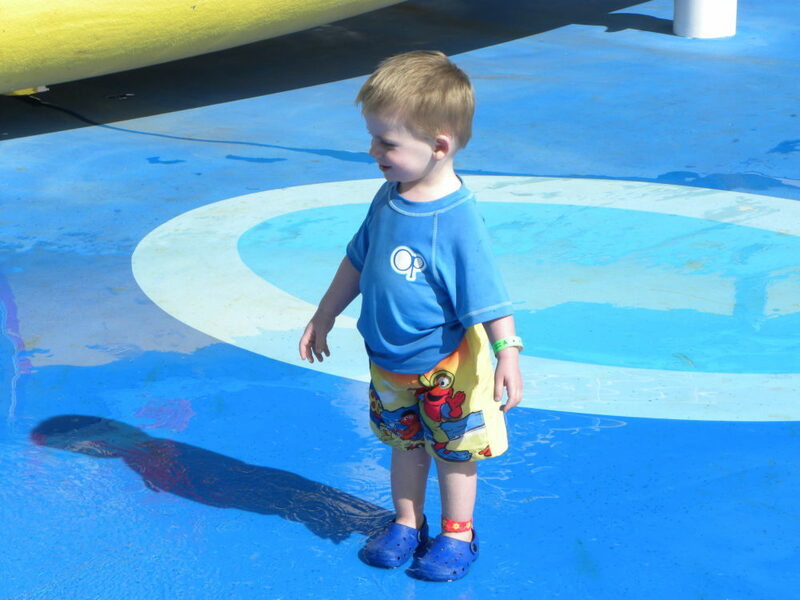 We went on the cruise in February so the water was a little cool in the water park and the air temperatures were only in the 70’s, but our boys still enjoyed the water park when the sun was shining. I would suggest a cruise more towards spring or more south for warmer weather in Jaunary or February if your family is desiring a lot of swimming. The price of the cruises changes per the time of the year so be sure to compare the price with differing time slots before booking. There was a game room filled with video games for the boys to enjoy. We did have to pay extra for this however so if your cruise offers a game room, check it out before the cruise shoves off so you know if you need to bring extra coins or cash for games. 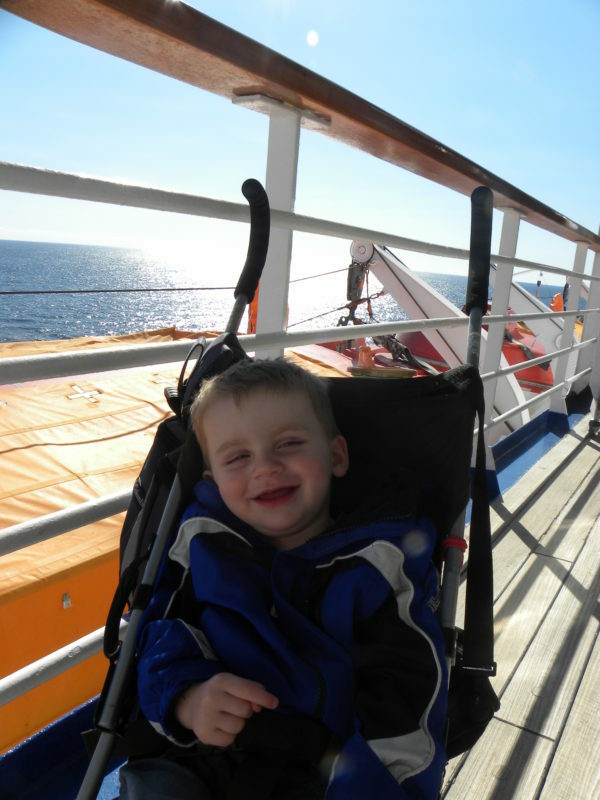 Cruising with kids tip: Bring a small bag to carry items with you around on the ship, or for on excursions. This comfortable and compact travel backpack below is perfect for carrying items you may need on the ship so you don’t have to go back to your room. It could work as a mini diaper bag as well if needed. Read my full review of this travel backpack. My favorite compact travel backpack! Love this bag, it has so many compartments. Our older two boys were old enough to go into the kid care area, but our youngest was too young to be checked in. I loved seeing our older boys’ faces when we picked them up from Camp Carnival because they were full of smiles and stories. They really enjoyed time spent there and asked to go back for certain activities. 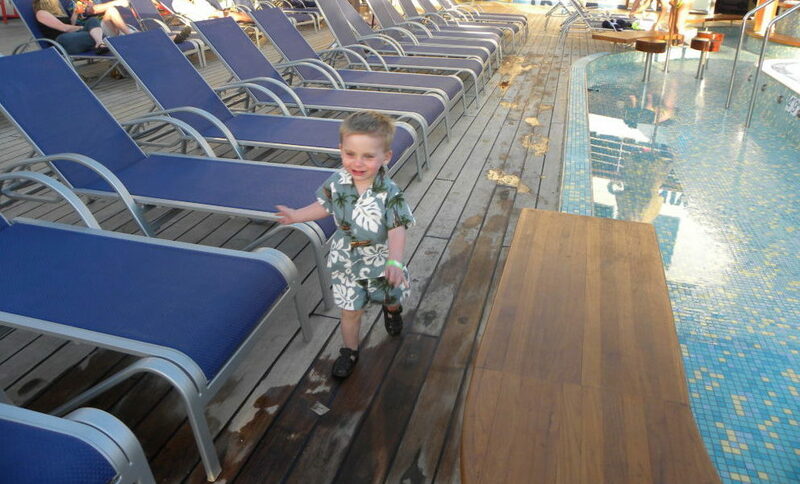 If childcare is important to you on the cruise, be sure to check the policies on age before you choose a cruise line. Camp Carnival was so fun for our kids! We knew we wanted excursions that would fit with our kids’ ages. We also knew we wanted to stay together as a family while on any excursions. Our youngest still was napping at the time, but he would often nap easily in the stroller, vehicle, or boat on our laps. We hoped to find excursions that offered a bit of downtime in case he needed a nap. The excursions we booked included some down time in the travel portion of the excursion, plus the excursions fit within the realities of what all of our kids could handle. The first excursion was the Dolphin Experience UNEXSO at Grand Bahama Island where we rode a small boat to the location where we were allowed to observe and touch a dolphin. (I loved the boat ride because two of our kids got naps during transit.) This excursion so much fun and I totally recommend it for a family with young kids.We knew the swimming with the dolphins would not be a good fit for our youngest and we really wanted to do the excursion all together as a family rather than splitting up. The Dolphin Experience excursion adventure worked out perfectly for us. We were allowed to get into a tank with a dolphin and touch him. He even gave us a kiss! In the first part of the presentation, we sat on the edge of the square pool and dangled our feet for the informational dolphin show. 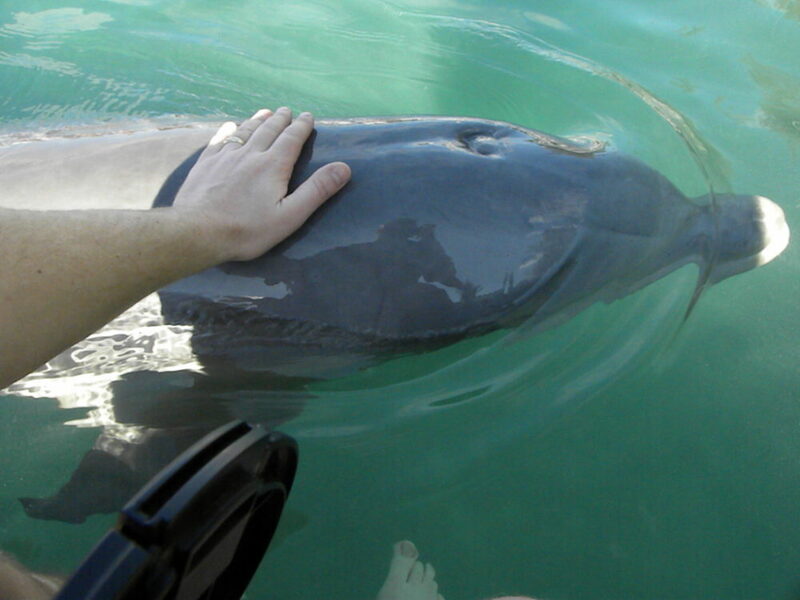 Afterwards, we were allowed in the pool to touch the dolphin. The workers told us the dolphin would feel like the egg white of a hard-boiled egg, and they were right! I found it to be a great educational and fun experience for our whole family. 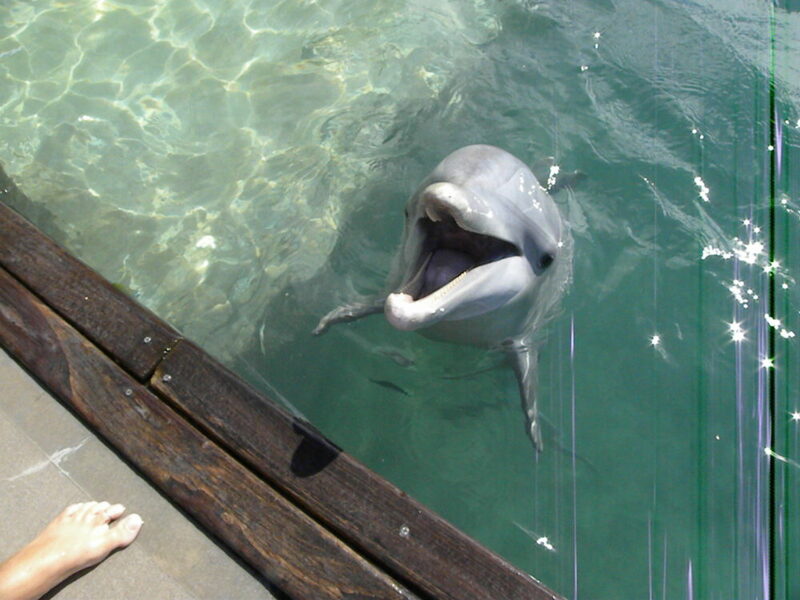 On the excursion, the dolphin felt like the egg white of a hard boiled egg! We knew we wanted another excursion that would fit out family’s needs. Our 19-month-old son was a wanderer and a runner. 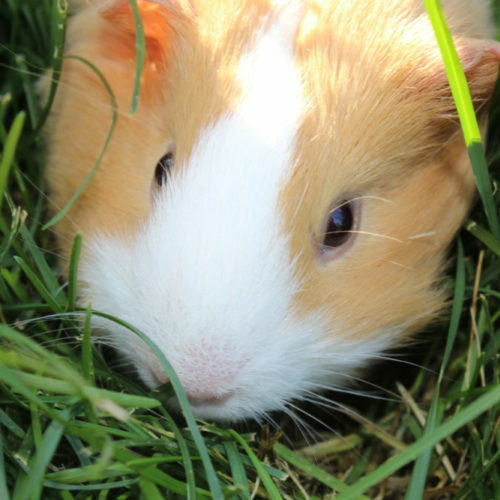 He would take off and we’d have to run after him to gather him back, he would never stay with us. He always tried to walk ahead of us or lagged way behind. We knew we needed another contained excursion, but we also wanted to be sure our older boys were entertained and interested. The Glass Bottom boat was the perfect experience to meet the needs of all of our kids. 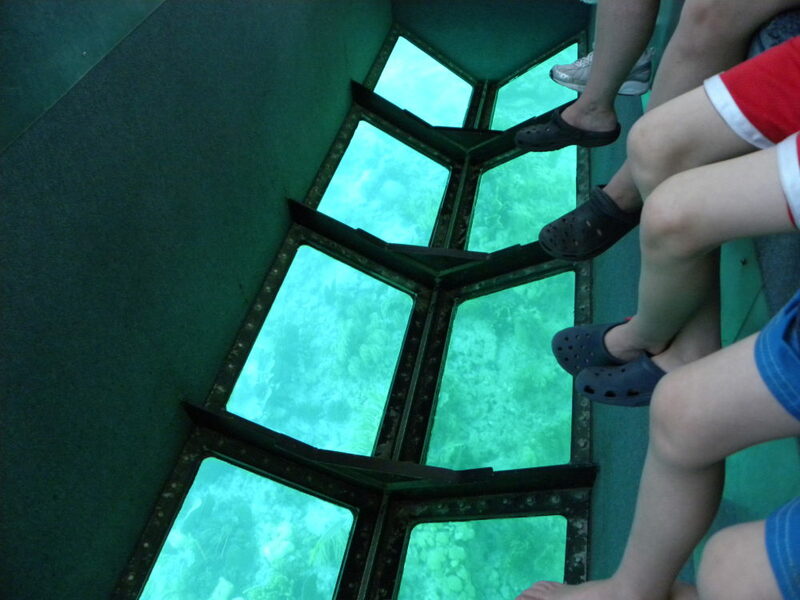 The Glass Bottom boat allowed us to see fish and sea life through the windows on the bottom of the boat. It was hard for our youngest to spot fish zooming by but he just loved being on the boat so that was enough entertainment for him. Again he got a nap on the boat while in transit. Our four-year-old also snagged a nap on the boat ride back to shore. Double score! Our excursion at Key West also brought us a bit of downtime to enjoy a little tiny beach we stumbled upon before our shuttle arrived. We enjoyed the shuttle ride across Key West back to the cruise ship. The homes and other structures were very distinctive, airy, and beautiful. 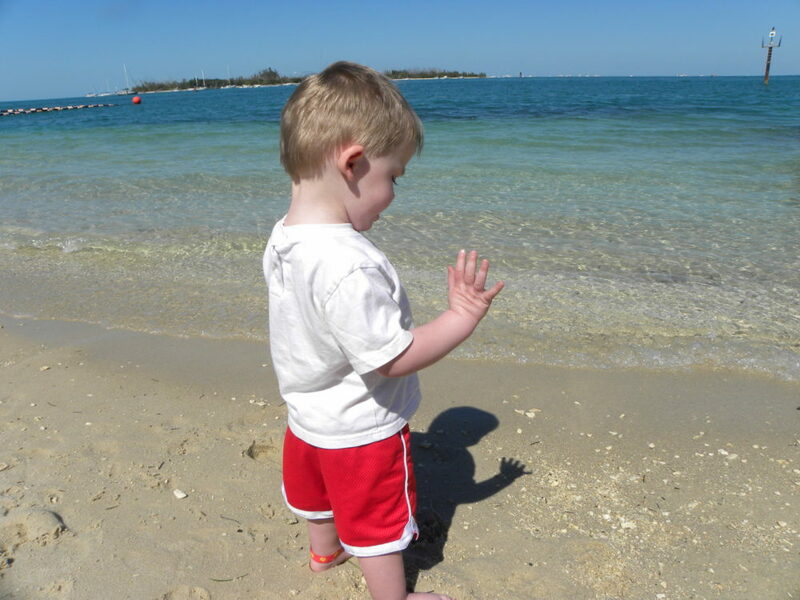 Simply hanging out at the beach is a perfect way to spend the day with young kids. We loved the carefree unstructured beach day. 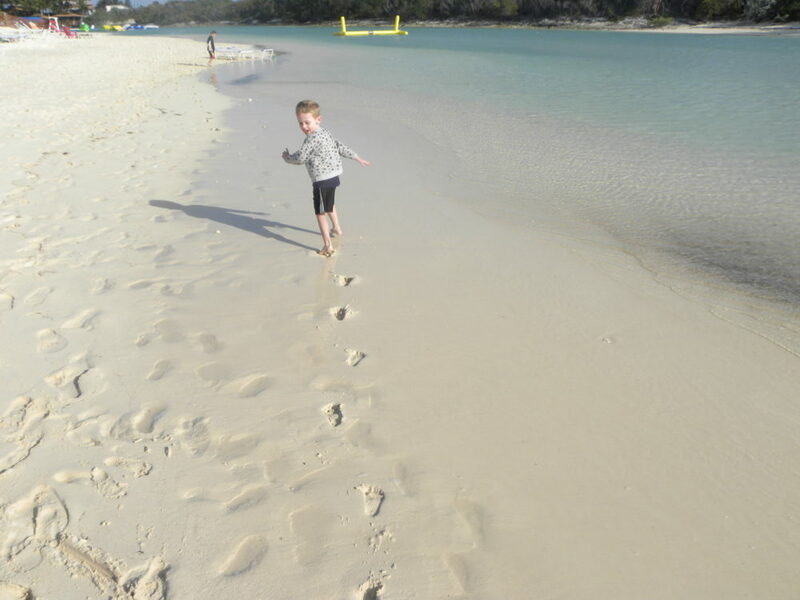 The kids loved to swim and play in the sand. 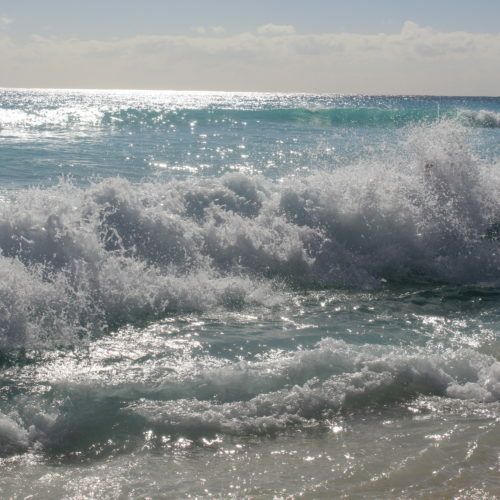 We enjoyed the simple joys of being on an ocean beach, a place where they never seem to get bored. We found ice cream as a snack and thoroughly enjoyed our day at the beach. The water was a bit chilly, but we all ventured in for a bit. 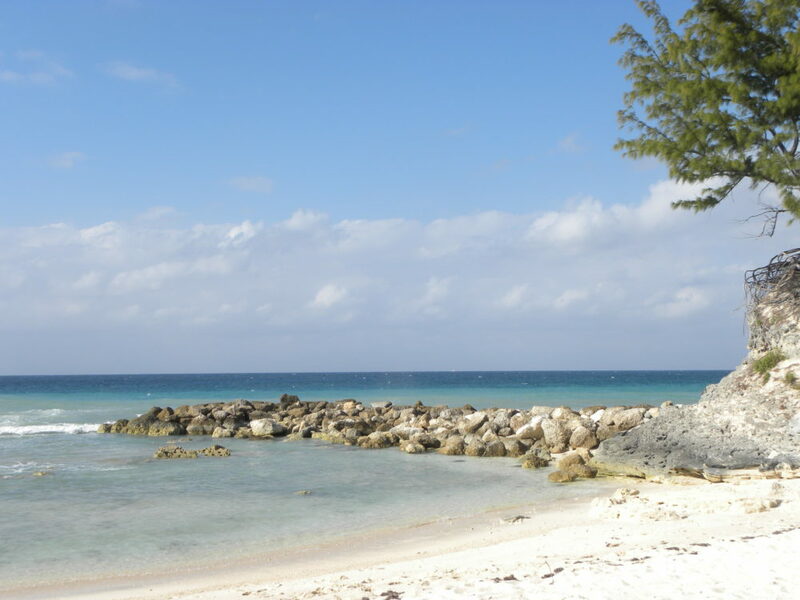 I loved our day excursion to the gorgeous private island called Blue Lagoon Island at Nassau, Bahamas. We rode a boat out to the island which was a fun experience all on its own. We saw wild dolphins swimming alongside the boat. The boat tour guide pointed out oceanfront homes owned by celebrities including Oprah, Christina Aguilera, Tom Cruise, and Eddie Murhpy’s private island. We also drove by the gorgeous Atlantis Resort. To read my review of the time my family enjoyed a day tour of the Atlantis Resort on a different cruise, click to read Is the Expense of a One Day Excursion to Atlantis Worth the Money? This Blue Lagoon Island was so beautiful. I loved all the amenities the island offered including a bay with low waves (perfect for young kids to swim in), dolphins, blow-up water features to play on in the bay, and giant blown up slides for kids. We didn’t swim for a long time however because the water was a little chilly. We found the water to be warmer in the bay versus the other side of the island which also had bigger waves. On the boat ride back to the mainland, our younger two boys again had a nap. I find as a mom to three boys, someone is always hungry. When we ate at the buffet, I would grab extra boxes of cereal, cracker packets, or pieces of fruit like an apple or a banana to bring back to the room for snacks. I grabbed little cartons of milk at breakfast too to store in our fridge if we planned to head back to the room after eating. This was a great idea because we developed a little stash in the room, plus I packed the extra snacks along on excursions for quick, easy to grab food options. This way I always knew I had something with me they would eat which is important for picky eaters like my kids. I loved how doing this reduced meltdowns due to hunger. We had our boys each pack up a bag of toys, stuffed animals, and games to bring along to occupy them while we were in the room in the evenings. Sometimes we found ourselves out and about on the boat in the evenings, but other times we headed back to the room after dinner for some downtime. Each day was different but I was so glad to have some toys in the room for the evenings. There was a tv in our room for the kids to watch, however, we also found it useful to bring a DVD player and DVD’s. This way if one child didn’t want to watch what was on tv, they could have their choice of movies to watch in their downtime. 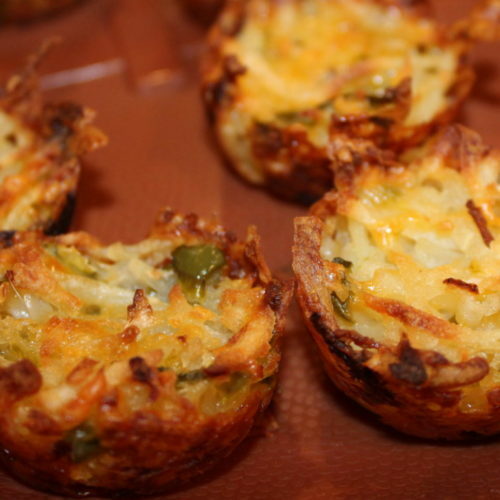 Are your kids used to eating an early dinner? Are they flexible to the point of being able to eat late if snacks are provided? Thinking about these questions will help you decide which dinner time to choose. 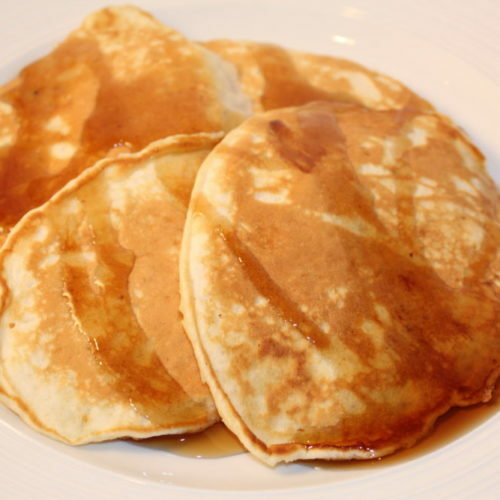 Many cruise ships have families choose a meal time and they stick with that meal time for the duration of the cruise. 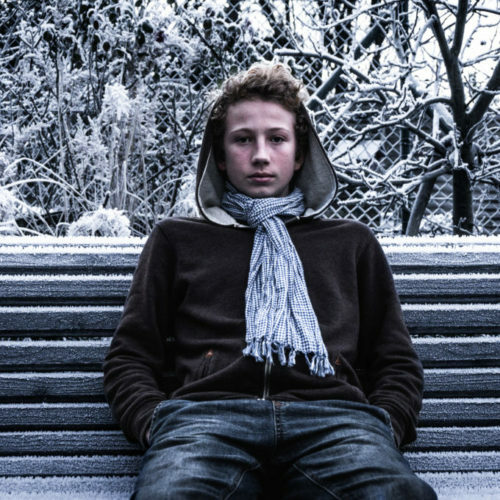 Be sure to consider how tired your kids will be and if they are able to wait to eat or if they need to each at certain times when you schedule your dining time. Our kids played hard so they were always very tired by the end of the day. I avoided the decks where there were skimpy railings with large spaces in between the rails. Having a tipsy, wandering 19-month-old on the ship terrified me a bit as a mom. The horrors I imagined of him toppling over the edge! I imagined him leaning over the low rail to see the water below, his little body easily fitting in between the bars, and watching him dive head first into the ocean because he let go to point at something. I won’t lie. This freaked me out and haunted me, so I simply avoided those decks with him and when we were on those decks, he was sitting in the umbrella stroller we brought, all safe and sound! The stroller was also nice when he was tired and we didn’t want to carry his heavy little body around, plus he could nap in it. I liked it because it folded up and didn’t take up much space. We found bringing the umbrella stroller was a lifesaver for us, especially at the airport. I would have loved to bring our large double stroller so two kids could have ridden, but it was just too big to bring on a cruise vacation. I packed sippy cups and a small bottle of dish soap for washing the cups out each night. Sippy cups are an obvious must have to prevent spills. I found bringing the dish soap was great because I didn’t have to use the bar soap in the bathroom for washing the cups. The cruise line had a dress code, but I only packed two nice shirts for each of my kids. This proved to be a problem because they would spill during dinner and end up with a stain on the front of their shirt. Having the dish soap along was a lifesaver because I used the dish soap also to scrub out any stains on nice shirts so we could comply with the dress code. Shampoo would work too, but dish soap cuts the grease better. I suggest bringing ziplock bags too. They work great for multiple reasons. They make great bags to seal diapers (and the smell) in when there isn’t a suitable garbage. The bags also are great for putting wet swimsuits in if the kids change out of their wet suits while out on an excursion. I loved having the wet suits in the bags because it kept the rest of the items in my bag dry. Ziplocks also work great to have along in case someone gets unexpectedly seasick. None of us ended up getting seasick, but I had packed plenty of Dramamine™ just in case. Ask your pediatrican for the appropriate dose of motion sickness medication for your child’s age and weight before leaving on your trip. I also brought cold medicine, ibuprofen (adult and child), medications for indigestion and diarrhea, and band-aids with antibiotic ointment. I packed all of these meds just in case someone needed it. I would rather have the medicine than be struggling to find some on the ship for minor ailments. I recommend you only visit the infirmary if you are fully convinced that you or a family member is truly sick. If it’s just a tiny bit of tummy upset, see if it will pass before heading over to the infirmary. The reason for this is because if you are sick, or infirmary staff fear you are sick, they might quarantine you for part or all of the cruise. If you or a family member really is sick, I would go to the infirmary to prevent any spread, but be sure it isn’t a simple temporary upset that will go away in a few hours on its own. I’d suggest just laying low to see if any symptoms pass to prevent any unnecessary quarantine situation from happening (I’ve met families who have experienced the quarantine). However, don’t delay going to the infirmary in an emergency of course. My children love to swim as much as they can and sunscreen washes off through time so I’ve needed to do many applications per day. I always find we go through a lot of sunscreen on a cruise vacation. We always hang out at the pool or we are off on an excursion for many hours each day outdoors so we use a lot of sunscreen. If you are going south from your home on the cruise, most likely the sun is hotter than it is at your home so reapply sunscreen often. 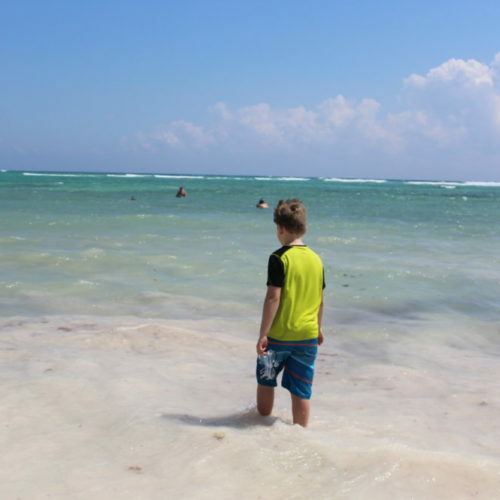 We have been on a cruise where my son didn’t reapply enough sunscreen and he was utterly miserable for a good day and a half before the pain eased; it was not much fun for him to experience on vacation. Pack some aloe vera gel just in case a sunburn happens. I always pack one spray sunscreen or lotion sunscreen per person. It’s busy while on a cruise because there is so much to do:) Of course, some people opt to sit and relax on a cruise, but as busy parents of three boys, we are constantly on the go on and off the ship. I often have to remind myself to take more pictures because I get so busy with the kids. Take lots of pictures of your kids’ sweet faces, fill up that memory card so you can have the luxury of deleting the bad ones. Bring an extra camera battery along everywhere just in case. You will want lots of pictures to document your family trip of your kids, you will never regret taking too many photos. I always make a scrapbook and buy copies for each child as a souvenir of the trip. Creating a scrapbook will give your child a lifelong treasure. I personally use Shutterfly™ as my favorite scrapbook maker. 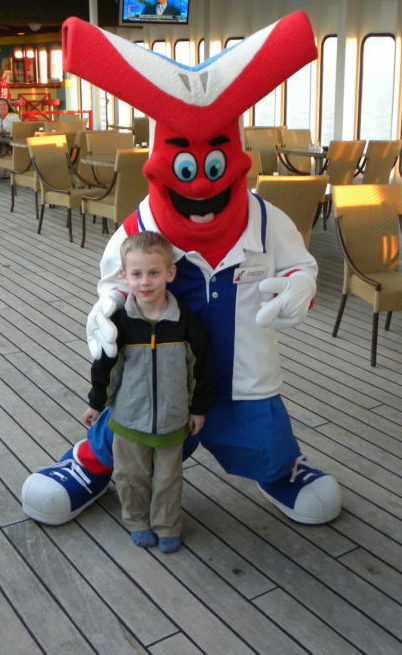 Family Friendly Carnival Cruise ship….where families can enjoy themselves and explore the world! Young kids tend to touch everything and my toddler put his fingers in his mouth all the time. This is not good for a family trying to stay healthy while on vacation so I costantly would clean my kids’ hands with hand cleaner while on the cruise. Traveling to new areas of the world can also expose your family to new germs so bring lots of hand sanitizer and hand wipes. Water isn’t always available for washing of hands while out on excursions, so I always pack extra hand cleaners and bring them everywhere I go on the cruise and on excursions. I like to bring wipes too because they can go on the airplane where hand sanitizer is not allowed (unless it is below the airline’s volume of liquid restrictions). I find those ziplocks come in handy again for storing liquid hand sanitizer in the suitcase. We had a wonderful time on our cruise! 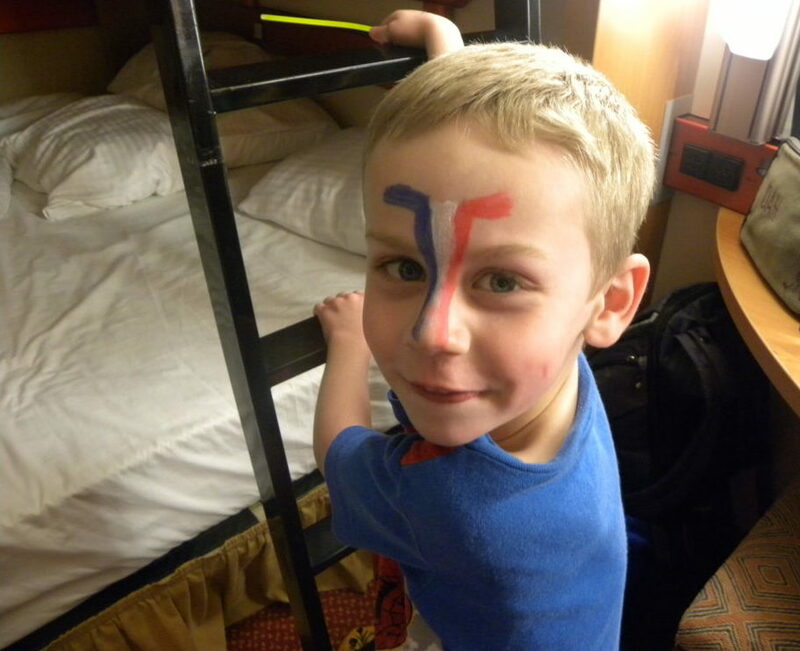 Carnival Cruise Line was a great choice for our family. I hope you find my tips useful and bon voyage! How to Enjoy Family Travel in a One Day Visit to Washington D. C.
I love putt putt.. whenever we go on vacations we HAVE to do this!!! it is a must for us! I remember growing up with all of these and want my son to have the same thing! Cruising with 3 young kids sounds quite daunting to me, but you’ve listed some really awesome things to do to keep them occupied. Cruising would be a wonderful family adventure. I hope you and your family love going on a cruise! We really have enjoyed cruising with our kids. We have been lucky and no one has experienced any seasickness other than when we went in a submarine once, my youngest got very seasick. Thanks, and I hope my post was helpful to you! 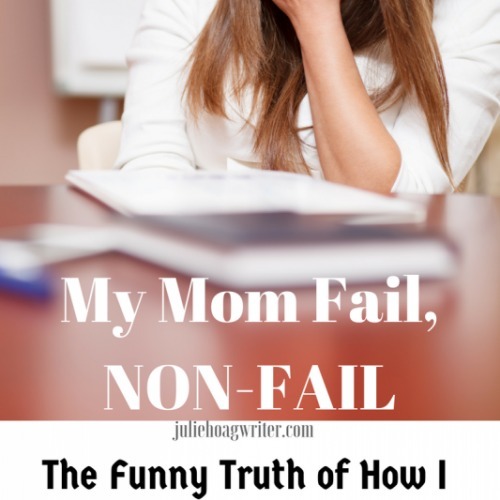 I’ve heard from quite a few families of five how difficult it is to book vacations since many cruise suites and hotel rooms are set up for a family of four. You were smart to book this cruise while your youngest is sleeping in a crib. All of your tips seem very helpful, especially the reminders for what to bring with you. 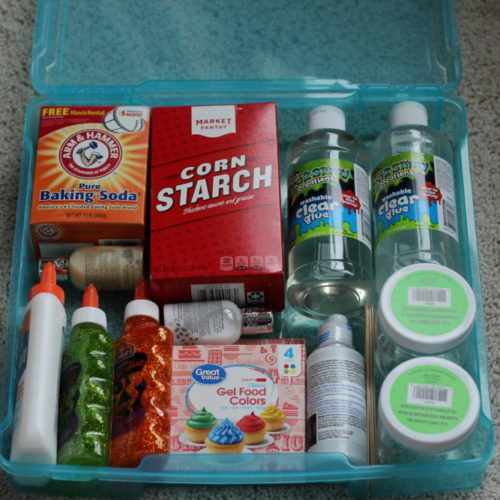 Ziplock bags and hand sanitizers are always good items to pack! I think cruises seem like fun vacations for families, and if I ever have kids, I’d definitely consider taking a cruise with them. As you said, it really comes down to finding the cruise that fits your family’s travel style for accommodations, activities, and excursions. Yes, finding accommodations for a family of five is quite a challenge. Some places even force a family of five to get two rooms! I don’t want to be in a separate room from my kids! Going on a cruise while he was in a crib was a great idea. Families of five just need to keep looking because family of five friendly vacation spots do exist. Thanks so much for your comment! I hope my ideas will be helpful!! My kids were the same age when we went on our first cruise! I agree with all of your tips, especially the one about bringing snacks to the room for later. Looks like a great cruise! Tip number two and three I think are priority for me. You definitely want to make sure your kids will have activities to engage in that are age appropriate and up their alley. This definitely makes me want to plan a cruise soon lol. 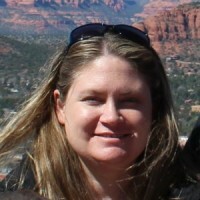 Yes, I think these are super important for kids and families:) Thanks for your comment!! This looks like a fun trip! I want to do this someday when my kids are a little older. Family travel with littles is doable but I also want them to remember it. I’m excited now! These are excellent tips. I never would have thought if some of these!! Thanks!! Totally saving this! Thanks! I hope my tips help!! Yes, I hope my tips are helpful to you! Thanks! Yes, I think both are a good choices in their own ways for a family vacation!! Thanks! I’ve always wanted to go on a cruise with the kids but don’t know how to pull it off! Thanks to this post, I know where to start! Thanks! 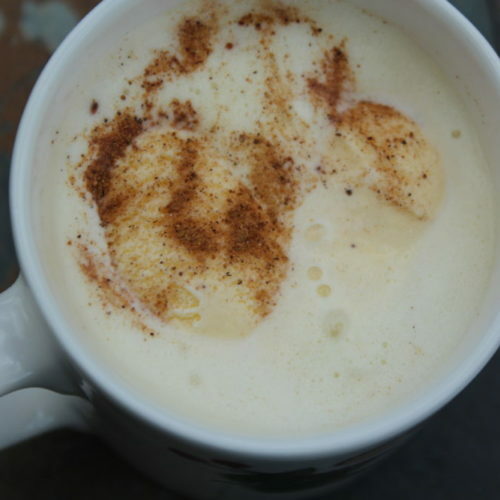 I hope you find my post helpful!! Yes, that route is so gorgeous with so many great adventures to be had! Thanks! Awesome! Hope you enjoy some family travel soon! I love cruising! I don’t have kids yet, but I can see how these tips would be really helpful! Cruising is awesome!! Thank you! I’ve NEVER been on a cruise! I always have the perception that that are too busy for my laid back vacation style, and that there is too much competition for the pool. 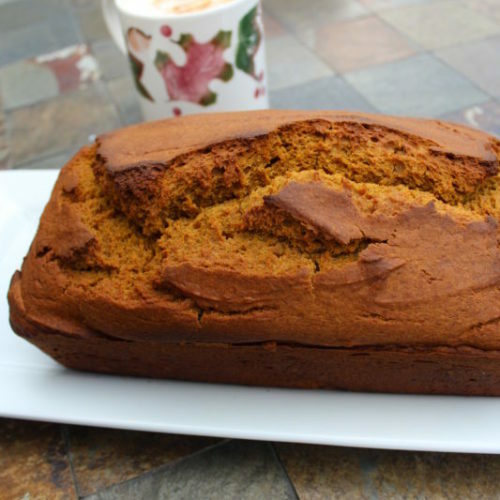 Reading this post is changing my mind – I love that there is something for the whole family! Right, there are so many options on a cruise. People can elect to do excursions or simply stay on the ship. When the ship is at a port and many people go on an excursion, there are often less people on the boat so the pools are less busy. It can be as busy or as laid back as you want. There are activities on the boat, or a family could elect to just hang out by the pool. It’s quite versatile and we’ve loved all the options a cruise offers for a family on vacation. Thanks!